Anne Kyyrö Quinn (http://www.annekyyroquinn.com/) is suggested in the course materials as an example of artists and designers who distort the surface of materials. I’ve done some sketchbook work based on photographs of Kyyrö Quinn’s work, and will use my sketches to illustrate my comments. /portfolio/10/1.html (Accessed 19 March 2015)). The actual panels are very much slicker. My top version in particular, a collage of foil corrugated card, is my emotional reaction to the precise, controlled, ultra-modern, stylish work, rather than a literal drawing. The lower version (Conté crayon on black paper) gives an indication of the patterning. I think the work is actually a single colour of very smooth red felt, cut, folded and stitched to create a pattern of shadow lines. Other works in the Portfolio use strong directional lighting to emphasize shadow patterning. The website describes the product as “resembling artworks more than conventional fabrics” and emphasizes qualities such as unique, handmade, not seen before, luxury, timeless, natural, “an elegant, unassuming beauty”, design excellence, tailor made (Kyyrö Quinn, n.d) . I have a very negative reaction to this work. It is too precise, controlled, anonymous. It’s serving a utilitarian purpose in a very stylish way, but I find it cold. The warmth and chaotic nature of felt is lost. It’s gone clinical. I also find the level of luxury off-putting, a reverse snobbery perhaps, but even the home interiors shown look like design showrooms with no personality or human presence. It is enormously clever and can play with lines and architectural space. On the right is my version of the reception area of New Reinsurance in London. A digital sketch seemed a good fit with an upmarket office vibe, but the original photos are so sharp, so mannered, so self-consciously clever (www.annekyyroquinn.com/portfolio/5/1.html). Anne Kyyrö Quinn’s felt panels (Leaf design again) wrap from both sides of the front wall and up along the passageways on either side of the reception desk. 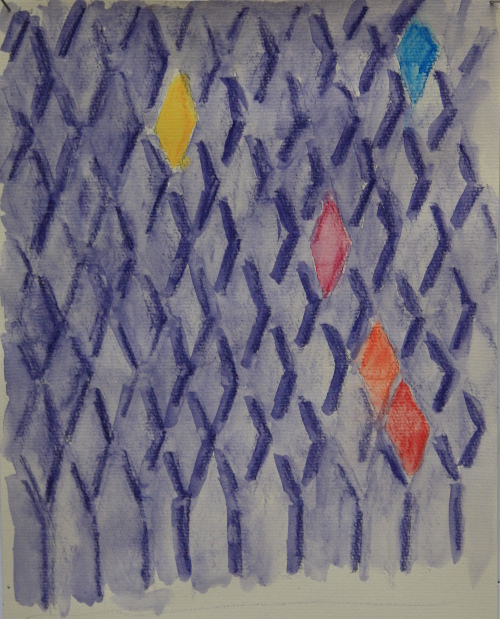 The lines of the felt folding and stitching play against the perspective lines. In fact the area seems all lines, with the exception of a small plant or similar on the desk. No receptionist is seen – how could a warm body survive in such a clinical environment? Interestingly – significantly, I think – this project was a collaboration with installation artist Francesco Draisci – see photographs on his website, draisci.com/projects/acoustic-curtain/, from which I learnt the slashes of colour are silk inserts. Two other items on Draisci’s site are relevant to this Part of the course. At draisci.com/projects/structural-folding/ is research based on the structural strength given by a fold in paper. 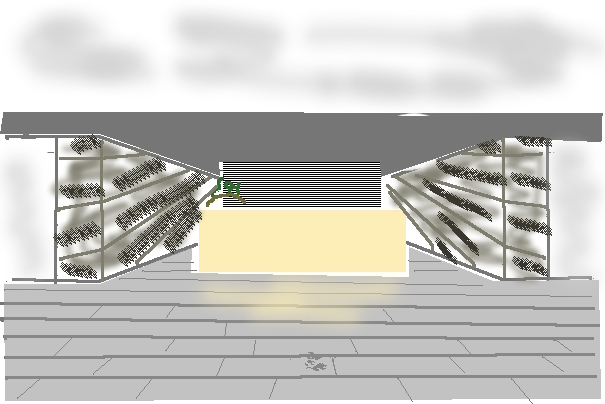 A temporary display space structure from folded 50mm thick honeycomb cardboard has been designed. The C.R.A.P.T. project (draisci.com/projects/c-r-a-p-t/) creates vessels with distorted surfaces created from adhesive tape and wool yarn. In other reading this week I came across Plight, a work by Joseph Beuys that involves wool felt on walls. My drawing is based on an image from Bacon (2013). I used charcoal for those sagging, baggy rolls of felt lining the walls, a shiny wax crayon for the grand piano, conté crayon for the parquet floor, on kraft paper for a nice earthy tone. 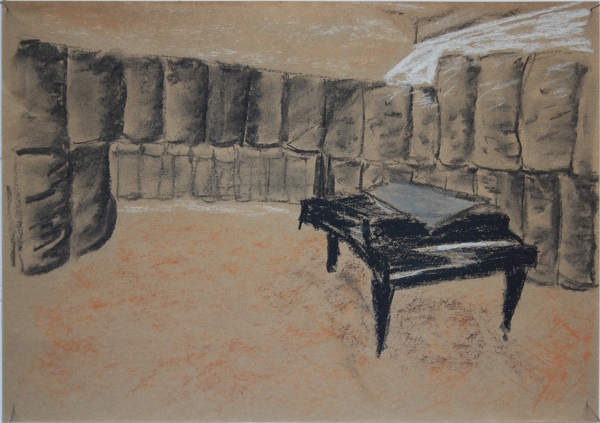 In my drawing the piano has too much presence, is not properly overwhelmed by the felt. In the photograph the felt looms, pushes into the space. It is in ranks, but not precise. It sags, is crumpled, asserts. It billows, suffocates and demands. It is not a polite, decorative element as in Anne Kyyrö Quinn’s work, although both were designed for the same function (Beuys’ installation was originally designed for the Anthony d’Offay gallery in response to noise from building work nearby (Gravelle, 2010)). The piano is silent. The temperature rises as warm bodies enter the space. Is it a womb or a padded cell? My mind is filled with competing associations. My eyes explore the space defined – confined – by the felt and I want to touch those beautiful imperfect rolls. This work has many layers of meaning. Beuys “made the material quality of chaotically structured felt a basic element of his art, integrating it in his theory of social sculpture” (Brüderlin, p 26). This is the line I want to pursue – concept, meaning, purpose beyond utility – although not necessarily excluding it. There is nothing really objectionable about Anne Kyyrö Quinn’s work – but who wants to set their sights on being unobjectionable? It is excellent work, excellent craftsmanship. For myself, I’m looking for something different. There was nothing at all wrong with the other course, just that the new one attracted me. When you’re investing this amount of time, energy and emotion you need to commit yourself and not be looking over your shoulder and wishing you were somewhere else. There’s a new contents page – fibresofbeing.wordpress.com/textiles-1-mixed-media-for-textiles/, I’ve heard from my tutor and have a date to aim for for Assignment 1 (25 May), and it’s time to get to work.